On my Ubuntu desktop computer, printing to Google Cloud Print works great when printing from Chrome. This screenshot shows how I can select my printer, the Brother MFC-J450DW, from the printers I have previously setup in Google Cloud Print. The problem is being able to select my Google Cloud Print printer from any other printer selection dialog box in Ubuntu. The answer is to setup a CUPS printer driver that knows how to print to your Google Cloud Print printer. CUPS Cloud Print is a Google Cloud Print driver for UNIX-like operating systems ( Linux, Mac OS X , BSDs etc ). It allows any application which prints via CUPS to print to Google Cloud Print directly. CUPS Clount Print is very easy to install on Ubuntu. You just add their Personal Package Archive (PPA), apt-get install cupscloudprint, and run the setup script, written in python. The setup script will prompt you for your Google user account. Then it generates a link which you visit in your browser. This will grant access to CUPS Cloud Print at Google and give you an authorization code. Just copy/paste that code when prompted by the setup script, choose an optional prefix for your Google Cloud Print printer names for when they show up as CUPS printers, and you're done. After this, your Google Cloud Print printers will show up in your Printers settings, and you can choose them from any Ubuntu Print dialog box. 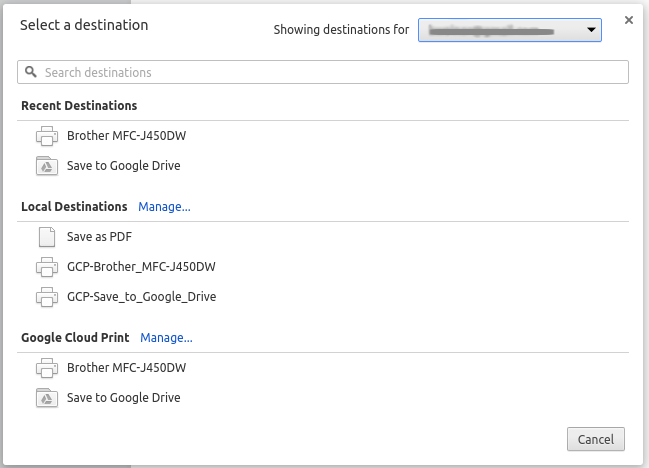 Here you can see that my Google Cloud Print printer name was Brother_MFC-J450DW and I told the CUPS Cloud Print setup script to use the prefix GCP-. The prefix makes it easy to distinguish the Google Cloud Print printers from other printers you may have installed. As you can see, I don't have any other printer setup besides the Google Cloud Print printers. It's nice to be able to print easily from anywhere within Ubuntu without ever having to install a proprietary printer driver. Thanks to Google Cloud Print and Niftiest Software for making this capability freely available!